The United States Mint on Thursday, Jan. 24, 2019, released for sale its 2019 Apollo 11 50th Anniversary commemorative coins. Almost a half century after humans first set foot on the moon, you can now buy a U.S. half dollar struck with the image of an astronaut's boot print on the lunar surface. 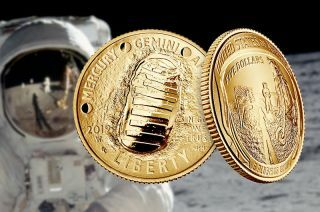 The United States Mint on Thursday (Jan. 24) launched its 2019 coin program commemorating the 50th anniversary of the Apollo 11 first moon landing. The coins, which went on sale at noon EST (1700 GMT) on the Mint's website, are available in gold, silver and clad metal editions. "Director Ryder wishes to congratulate the men and women of the Apollo space program for their incredible hard work that we honor here today," said Uram. Each of the coins share the same design and are curved; one side is domed, the other side shaped like a bowl. The coins' reverse, or tails side, is convex, resembling the outward curve of an astronaut's helmet and feature a design based on an iconic photograph of Buzz Aldrin's visor, showing the Apollo 11 lunar module "Eagle," the American flag and Neil Armstrong on the moon's surface. The obverse, or heads side, is concave, curving inward to the engraved image of Aldrin's boot print in the lunar soil. The design also features the names of the three NASA human spaceflight programs that led up to the first moon landing: Mercury, Gemini and Apollo. The U.S. Mint has also produced an Apollo 11 50th Anniversary 2019 proof half dollar set, which includes one Apollo 11 50th Anniversary proof half dollar and one Kennedy enhanced reverse proof half dollar, "to commemorate the enduring relationship between President Kennedy and the American space program." The set is a limited edition of 100,000 units and retails for $53.95. A second set that pairs an Apollo 11 50th Anniversary half dollar with an Australian 50th Anniversary of the Moon Landing 1 oz. $5 silver coin is also planned through a partnership between the U.S. Mint and the Royal Australian Mint. Further details and availability of this set have yet to be announced. As authorized by Congress in 2016, proceeds from the sale of the U.S. Mint coins benefit three space-related organizations that preserve space history and promote science and engineering education: the Astronauts Memorial Foundation, the Astronaut Scholarship Foundation and the Smithsonian National Air and Space Museum's "Destination Moon" gallery, scheduled to open in 2022. The Apollo 11 50th Anniversary commemorative coins are only the second time the U.S. Mint has produced curved coins. "The U.S. Mint is honored to have the opportunity to present the world with a memento to recognize the sacrifices made by the early space program astronauts and their families and mark the 50th anniversary of Apollo 11," said Apollo 11 capcom Charlie Duke, who became the tenth person to walk on the moon on Apollo 16 in 1972. "The surcharges from this coin have been authorized to support the missions of three non-profits who represent the history of the space program while supporting the next generation of explorers, innovators and calculated risk-takers who will continue to discover new frontiers." The Apollo 11 50th anniversary commemorative coins are the fourth time that the U.S. Mint has honored the first moon landing on coins it has struck. The 1971 Eisenhower dollar (and later 1979 Susan B. Anthony dollar) featured the Apollo 11 mission patch on its reverse. The Ohio state quarter issued in 2002 included a depiction of an Apollo astronaut, representing Neil Armstrong. And the 2011 New Frontier medal reproduced the design of the Congressional Gold Medal awarded to Armstrong, Aldrin and Michael Collins. For more details or to purchase the Apollo 11 50th Anniversary commemorative coins, see the U.S. Mint's catalog website at catalog.usmint.gov. See more photos and read more about the United States Mint's Apollo 11 50th Anniversary commemorative coins at collectSPACE.